School of Arts Theatre, Townsville, QLD. Melbourne-based dancer, composer and choreographer Alisdair Macindoe presents A Pre-emptive Requiem for Mother Nature as part of Dancenorth’s 30th Anniversary Season. Taking inspiration from the notion that there could one day be a point of separation between our human form and our identity, the piece explores the wonder of the natural world that we often take for granted. Preceding the dance piece is a short robotics display featuring percussion devices that have been hand-made and programmed by Macindoe. Clever and quirky are two words that most fittingly describe the work. 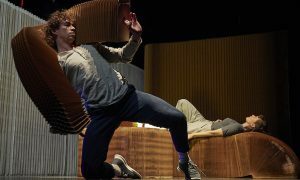 It provides the audience with some insight to the creativity of Macindoe’s mind and his fascination with technology, a medium that appears in his choreography. The dance opens with a dimly lit stage. The dancers slowly emerge from the back, accompanied by the first movement of Polish composer Henryk Goerki’s third symphony. The movements performed by Harrison Hall, Mason Kelly, Jenni Large and Amber Haines are somewhat pedestrian while possessing an extraterrestrial quality. The dancers travel across the space, pausing at random intervals. They move independently while in synchronization. At times it was as though another force was in control of their bodies as they moved like weightless beings in outer space. There are some beautiful moments of fluidity, suspense and manipulative partner work throughout the piece, intertwined with spasmodic, forceful and rigid choreography. Dancenorth in ‘A Pre-emptive Requiem for Mother Nature.’ Photo by Amber Haines. 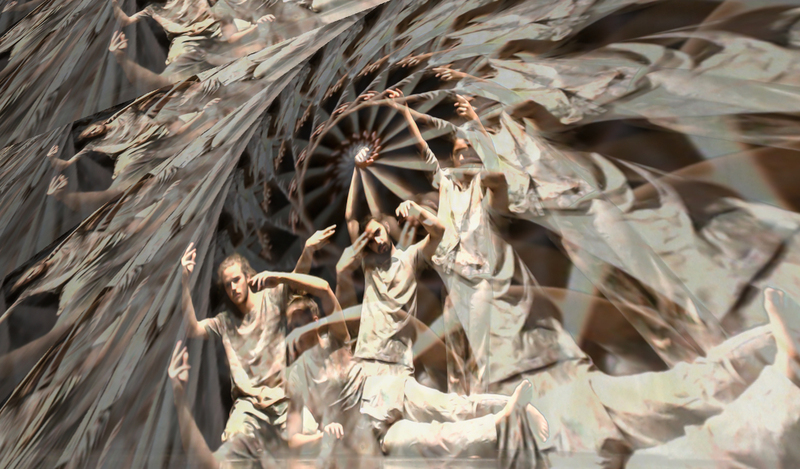 As the dance progresses, a kaleidoscope of images start to appear on a scrim set up in front of the stage, the projection design created by Macindoe. The pictures dance across the screen in harmony with the dancers behind, like a three dimensional hologram. This provides the audience with a different perspective of the performance, and is a delicate visual delight. The costumes, also designed by Macindoe, use natural hues and are simple, yet effective. The colours, paired with the choreography and lighting, conjure images of leaves falling from a tree and blowing about in the wind. The lighting design by Gavin Ruben marries perfectly with Macindoe’s choreography. A notable feature is a large, circular pattern of light globes, crafted by Ruben, which glow like a sun from the back of the stage. As it glows it seems to give a new life to the dancers’ movements, much like the dawn of each morning giving birth to a new day. With his latest piece, A Pre-emptive Requiem for Mother Nature, Alisdair Macindoe cements his description as one of Australia’s most exiting young choreographers. The work will make you reflect on your own connection with nature and will leave you wanting more. 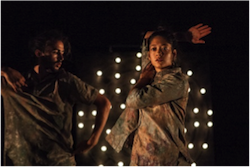 Audiences in Cairns, Mackay, Melbourne and Brisbane can enjoy A Pre-emptive Requiem for Mother Nature alongside Syncing Feeling, created by Kyle Page and Amber Haines, when Dancenorth take both works on the road for the In Two Minds Tour throughout August. To see tour dates, head to http://dancenorth.com.au. By Amy Bent, special to Dance Informa. Top photo by Alisdair Macindoe.